Barcelona Salad and Veggie Sandwich. Oil-free. Barcelona Salad and Veggie Sandwich. Oil-free. One of the things I really enjoy about cooking is trying to recreate restaurant meals. Sometimes I even think that I’ve gotten a recipe just a little bit better than the original – but that’s probably because I believe the best meals are those made and eaten at home. This quick and easy salad-and-sandwich combination was inspired by a delicious lunch shared with my mom, dad and Kel during a recent trip to Marco Island, Florida. We cooked most of our meals at our rental house, but found this vegan-friendly restaurant right in the heart of Naples. The food was simple and very fresh and the company couldn’t be beat. I eliminated the olive oil in both the sandwich and the salad – they just don’t need it! And I created a kind of chopped salad for the sandwich filling rather than keeping the ingredients whole. I thought it would be easier to eat that way (plus you get a bit of everything in every bite), but it turns out, this sandwich is just messy. Serve it open-faced if you aren’t eating this with family! Bright, tangy, crunchy – this refreshing and oil-free salad and veggie sandwich combo is ideal for a light lunch or dinner. Cut the baguette in two and then slice each piece in half. Set aside. 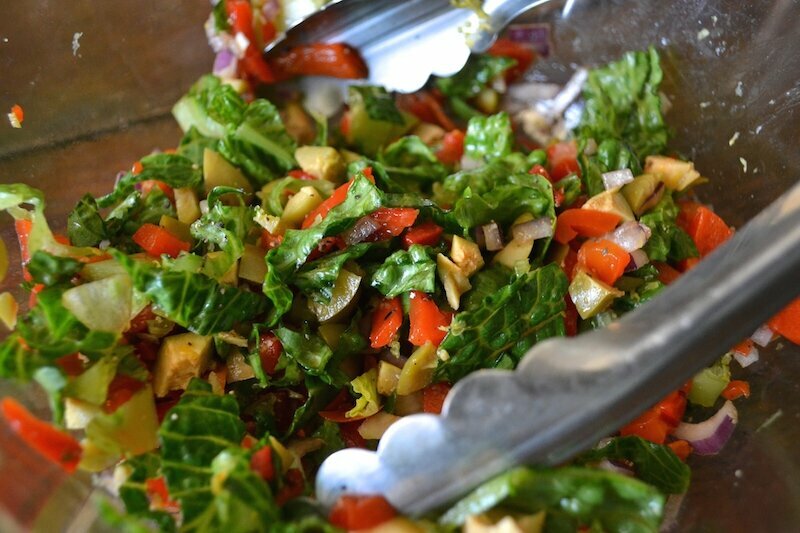 In a bowl, combine the roasted pepper, lettuce, olives, red onion, lemon zest and black pepper. Divide the mixture between the baguette slices. Lightly brown the pine nuts, raisins and apple in a dry skillet. Stir often to prevent burning. Add a splash of vegetable broth and put the spinach in the pan, turning to gently wilt it. Turn off the heat and remove the pan from the burner and splash the spinach with lemon juice. Stir and divide the mixture between two plates. Funny – everyone is complaining about the cold. I guess we’re all being hit with a last blast of winter. Bring on the sun! Warm weather food. Hope we get some soon…warm weather that is…followed by delicious food like this. We need some warm weather, too, Bridget! We had a sneak peek of warm weather and then – boom! – cold again. Have a question about my waffle experiment but I’ll catch you on FB for that. I agree – simple food is the best. So often we mask the flavor of the ingredients with lots of sauces or spices. Hehe, you just nailed one of Kel’s pet peeves (starting a sentence w/ “honestly”) – but sometimes it works. That sounds (and looks) wonderful! You’re very good at tracking down vegan restaurants, and it must be a real joy to stumble across them in a new place. I think I’d do the same as Angela and pile everything onto the bread; I love a well packed sandwich spilling over with salady stuff. Yum! You gotta be a sleuth or you don’t eat ;-). It’s amazing what you can find, too. I’ve even got a staff of two working for me (not unlike your lovely assistants, eh?) – a friend who is an expert internet searcher and my dad :-). I knew you were a smart gal 😉 There’s nothing like a bit of delegation. I love restaurant re-creations! I can see why you’d want to make this one all over again! Scrummy! Sometimes you’ve just got to see if you can do it better ;-). I’ve got no doubt that you did! These both look really good! I’ll have to try them out. That baguette looks yummy! Did you make it yourself? Thanks, Kathryn! Yes, homemade – a no-knead recipe :-). Ooh, do you have a link to the recipe? I would love to try it out! I use some whole wheat flour. Thanks! Doesn’t look like too hard of a recipe 🙂 I’ll have to try it. I love a good baguette, there’s nothing like them. I could just eat a good baguette for lunch sometimes! As much as I love a good baguette, you could eat that sandwich filling as a salad! Yum! Yep, it makes a darn good (and so simple) salad. My goodness this looks delicious! I just ate lunch and this post is making me hungry all over again! I love that it’s surprisingly simple (from the way it looks). Like you, I also try to recreate dishes from my fave restaurants, it’s a fun activity especially if it achieves the same result or better. Totally simple – you can put it all together in under an hour. As my food choices evolve it gets harder and harder to find (what I call) a good restaurant! This sounds so fresh and filling! Isn’t it fun to recreate restaurant meals at home, adding your own touches and preferences? This seems like the perfect summer weather sandwich!